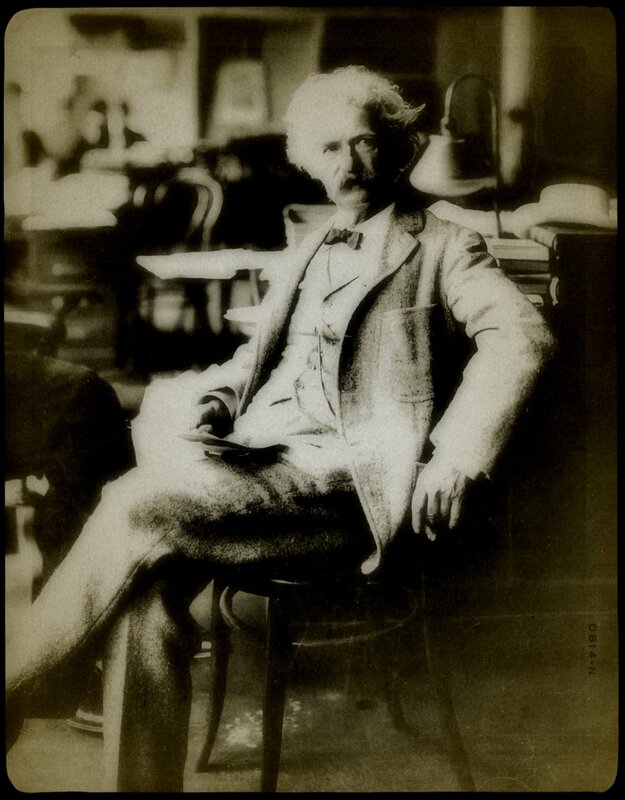 On November 30, 1835, Samuel Langhorne Clemens – who became better known as Mark Twain – was born in Missouri. This seemed to be the perfect place to talk about a side of Twain’s life that is all too often ignored by historians and biographers. Just as they do with Abraham Lincoln, most scholars ignore the fact that Twain also had a lifelong interest and fascination with the supernatural. For most of us, there is no person who embodied the glory days of the Mississippi River in the way that author and former river man Mark Twain did. Twain was a humorist, curmudgeon and gifted author who created some of the greatest American books of all time, including Tom Sawyer and the Adventures of Huckleberry Finn. While most readers are very familiar with Mark Twain’s adventures, books and humor, many don’t realize that the author had a deep interest in mysterious happenings. Throughout his life, he made a career out of debunking pomposity and arrogance. He was willing to accept things that were “outside the norm”, including telepathy, ghosts, prophetic dreams and more. He even became one of the most famous members of the widely acclaimed Society for Psychical Research. Twain’s real name was Samuel Langhorne Clemens and he was born on November 30, 1835 in what he called the “almost invisible” town of Florida, Missouri. He grew up in the small river town of Hannibal, a place that would be made famous through his books. Twain’s curiosity about things unknown was awakened at about age 15, when a traveling hypnotist came to town to perform. The magician demonstrated a number of “mind reading” acts that Twain quickly figured out. This incident alerted him to fraudulent claims of the supernatural. He knew the man was an obvious fake, but believed that there were real supernatural events occurring in the world. In fact, he believed that he had experienced some of his own in earlier years. Just outside of Hannibal lived a farmer’s wife who had a healing power to cure toothaches. She would place her hand on the victim’s jaw and then shout the word “believe!” The toothache would be instantly cured. Twain was present on two different occasions when such miracles were performed – both of them involved his own mother. Twain witnessed another strange event a few years later when a young woman that he knew named Olivia Langdon became an invalid at age 16. She was partially paralyzed after a fall on some ice and was unable to leave her bed for nearly two years. After several doctors tried to help the girl and failed, a relative suggested that the family contact a faith healer known as Dr. Newton. He prayed over Olivia, put his arm behind her shoulders, raised her up and after a few moments, she took several steps. Until that moment, any attempt to raise her up had brought nausea and fainting spells. Newton said that Olivia would never be totally cured, but that she would be able to walk at least several hundred yards at a time. Years later, Twain asked Newton what the secret behind his power was and the doctor told him that he didn’t know. He believed that some subtle sort of electricity emanating from his body might hold the answer. Whatever it was, Twain was always grateful to the man because he married Olivia in 1870. The death of Twain’s father started his writing career. He had to leave school and he became a printer’s apprentice at the Hannibal Courier newspaper. He moved on from Hannibal to the composing rooms at several newspapers, including two in Philadelphia, and then went to become the city editor for the Virginia City Enterprise in Nevada and a reporter for the San Francisco Morning Cable. In between, he traveled and worked a variety of odd jobs, all of which gave him experiences that he could write about, eventually allowing him to be hailed as one of America’s greatest writers. In 1858, Twain became a steersman on the packet Pennsylvania, which traveled the Mississippi River between St. Louis and New Orleans. He began learning the riverboat trade under the tutelage of Captain Horace Bixby, who worked to teach him more than 1,200 miles of river. It was during this time of his life that Twain had what he considered his most remarkable psychic experience. It was a vivid prophetic dream in which he saw his brother Henry as a corpse, lying in a metal coffin, dressed in one of Twain’s own suits and with a bouquet of flowers on his chest. In the center of the flowers was a single red rose. The casket in which Henry had been placed was balanced between two wooden chairs. Not long before, Twain had found a job for his brother on the Pennsylvania and the two men were very close. They worked together on as many shifts as possible and often one brother would join the other on his watch when the other’s work had ended for the day. However, at the time of the dream, Twain was in New Orleans and his brother had departed on the Pennsylvania. Before the steamboat had departed without him, Twain had advised Henry that he should not lose his head in case of trouble. “Leave that to the unwisdom of the passengers,” he told him. He urged Henry that, after seeing to the safety of the women and the children, he should swim for shore himself. Twain knew how common accidents were and he wanted to make sure that Henry would not get himself into trouble. Two or three days after the boat had departed from the New Orleans dock, the boiler of the Pennsylvania exploded. Twain managed to reach Memphis a short time later and found Henry near death, lying alongside the rest of the wounded. The details of the story are related in Twain’s classic book, Life on the Mississippi, and told of how Henry died from an accidental overdose of morphine that was given to him by an inexperienced doctor. His funeral costs were arranged thanks to the generosity of the ladies of Memphis, who had taken up a collection for the victims of the disaster. All of the deceased were laid out in coffins made from white pine, however Henry’s casket had been made from metal instead. When Twain walked into the room where his brother’s body was placed, he found him in an open coffin, wearing a suit of Twain’s own clothing – it was just like in Twain’s dream. Eerily, an elderly woman walked past him into the room and placed a bouquet of roses on Henry’s chest. The flowers were snow-white in color – except for a single red one in the center of the bundle. And the strange events continued when Twain returned with his brother’s body to St. Louis. As several men took the casket to his brother-in-law’s house and were carrying it upstairs, Twain stopped them from going inside. He didn’t want his mother to see Henry’s face, as it had been badly distorted by the overdose of the drug. When Twain did go upstairs, he discovered that two chairs had been placed as a stand for the casket. Had he arrived a few minutes later, the coffin would have been in the same place as it had been in his dream. When he stopped the men outside, he had changed the prediction of the dream. As a result of this strange experience, Twain developed an interest in the paranormal. He was constantly intrigued by what he called “thought transference” and claimed to often speak aloud the very thoughts that his wife was having. He was also interested in the fact that he would often receive unplanned letters from friends after merely thinking of them or the subject of the letter they might write. One example of this occurred between Twain and the Virginia City journalist William H. Wright. The Nevada silver boom was in the news and Twain’s publishers felt that it was a good time for a book on the subject. Twain thought of Wright as the man to write the book and on March 2, drafted a letter to him, urging him to write the book and making several suggestions for an outline. Twain finished the letter and sealed it into an envelope and then had second thoughts. If Wright penned the book and then couldn’t find a publisher for it, Twain would be in an uncomfortable position with his friend. He decided not to send the letter and stuck it away inside of his desk. A week later, on March 9, several letters arrived in the mail for Twain and one of them was from William Wright. Twain told a visiting relative that he could tell them the date, signature and the subject and all “without ever breaking the seal”. He explained that it would be from “a Mr. Wright of Virginia City, and it is dated the second of March - seven days ago. Mr. Wright proposes to make a book about the silver mines.. and asks what I, as a friend, think of the idea”. Twain then opened the letter. He had stated the date and the contents correctly and found that it reflected the contents of his own letter, written on March 2, which had been in his desk since it had been written. After Susy’s death, Twain’s wife retreated into full invalidism, staying in her room and avoiding her husband’s own black despair. She lost interest in her friends and began to immerse herself in Spiritualism, a faith that believed in communication with the dead. Twain began to share her interests and while he attended a number of séances, never became convinced that he personally contacted the dead. His bleakness deepened as the years went by, until his family and friends all avoided his ranting and gloomy moods. Living in mourning and seclusion, he treated his surviving daughters like royalty and each holiday that came around was celebrated as a remembrance of Susy. He often dreamed that she was still alive and in his declining years, questioned the difference between dreams and reality, wondering if perhaps she was returning to him in his dreams. The author’s dark days of brooding did not last. His life had always run in cycles of success and despair. He began lecturing again and wrote his book on Joan of Arc. Then, in 1904, Olivia passed away from heart trouble. He once again sank into grief and despair, only to revive again and begin writing and lecturing once more. He wrote a paper on a hypothetical experiment with “Mental Telegraphy” in which a man was to invent a scheme that would synchronize two minds, thousands of miles apart, enabling them to talk to one another. He was unhappy with the article and burned it, along with many other writings on the occult. He would not write such a book on the subject, he said, unless it “would write itself”. He stated that he would ignore such writings but that when he was asleep, new ideas would come to him. However, most of these works were never completed. And his final prediction had been correct. He came in with Halley’s Comet and he did “go out” with it, just as he planned to.